Sweet 16 it wasn't for Harrington and it later emerged that the final pairing had been put on the clock by officials on the 16th tee, leading to a rash of rushed shots by Harrington and that disastrous finish. “It was a great match, a great battle as I said it would be yesterday,” Harrington said. “I was thoroughly enjoying it all the way through, really was enjoying it, really got into it through the end of the front nine all the way through the back nine. I was right in there in the zone, which was very nice. It really was a good match at that stage." Explaining what happened on the 16th, he added: "When you're out of position, it's difficult to be on the clock. I was out of position on the tee shot, second shot and third shot. You've got to be pretty straightforward when you're in position, but as I said, I was in trouble every time, and it just puts a little bit of added doubt into the equation, and certainly knocked me out of my comfort zone. The time warning completely shattered Harrington’s focus and while he accepted the application of the rules, he was obvious that he was disappointed. Both men had sprayed their drives at the downhill par-five, Woods to the left and Harrington to the right. But while the Dubliner's attempted lay up found an awkward lie on the grassy face of a fairway bunker, Woods safely found the fairway and then hit the kind of shot that makes him the best player in the world. Faced with a 178-yard third over water, he hit a towering eight iron that screwed back to a foot and watched Harrington implode in stomach churning fashion. With 159 yards to the pin and standing with one foot in the sand , the Dubliner's third shot plummeted into rough over the green. From there he thinned his attempted flop shot down the slope and into the lake. After a penalty drop he overshot the green again from 94 yards before chipping and putting for a triple bogey eight. It was cruel. By the time Woods tapped in for birdie and a four-shot swing, Harrington had played five shots and found himself tied for second with Allenby (66) on eight under. Looking on the bright side, the Irish star can take solace from the fact the his game is very much back on track after eight months of agony. He's also certain to qualify for the first FedEx Cup event, the Barclays, at the end of the month. Still, the timing warning on the 16th left a sour tasteanda72ndholebirdiebyWoodswassimplyturningthescrew. “They put us on the clock on the 16th,” Harrington said. “It's an awkward situation. There are rules and the players make the rules and we've got to apply them. Woods was simply sublime on the front nine, hitting every green in regulation and racking up and eagle and three birdies to turn in five under par 30 to Harrington’s level par 35. He used the blade just 14 times to go from three behind to two in front. His two longest putts were a 24 footer for eagle at the second and a 27 footer at the fifth and inevitably, he holed both. But Harrington stuck to his guns admirably during the onslaught and cut the gap to a shot when he followed a run of 10 pars with wedge to eight feet at the 11th. That appeared to rattle Woods, who missed his first green of the day at the 12th and had to hole a six footer to stay ahead. At the 13th, the world number one drove into the trees right but after a lucky ricochet into the fairway, he overshot the green and bogeyed. They were level and it was game on. 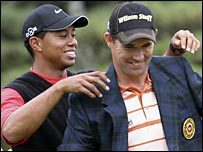 Harrington knew he was in for a torrid time on a course where Woods has claimed the Bridgestone Invitational six times. But he was hit by the proverbial Tiger Woods Express with the world number one erasing the three shot deficit in the space of four holes before taking the outright lead at the fifth. Having shared the first in pars, the tide began to turn Tiger’s way at the 526-yard second where Harrington was bunkered off the tee and had to lay up. Smelling blood, Woods unleashed a towering 224-yard five wood that nestled 24 feet below the hole. Harrington’s 60 yard approach spun off the green against the collar of rough and Woods pounced by draining his eagle chance to close the gap to a single stroke. Harrington had to dig deep just to hole an eight footer for par. At the fourth they were level on 10 under when Harrington missed from 16 feet and Woods holed from 11 feet for birdie. The world number one appeared to have stolen Harrington’s magical putting touch. Harrington got inside Woods for the first time all day at the 200-yard fifth but Woods stole his thunder by rolling home his 27 footer for birdie to take the championship lead for the first time. Playing with the relentless rhythm of a metronome, Woods had chances from 19 feet at the sixth, 15 feet at the seventh and 16 feet at the eighth before he holed a seven footer at the ninth to turn in five under par 30. In contrast, Harrington was bunkered greenside and had to hole a six footer just to remain level for the day and turn for home in 35. He came close to overhauling Woods down the stretch but that time warming and the triple bogey that ensued shattered the dream.